In the past few weeks, Woodland High School was selected as a SkillsUSA National Model of Excellence; Woodland Middle School’s food services staff helped an eighth grader cook a recipe for the entire school; and Woodland Intermediate School students competed in the annual Future Chefs of America competition. Woodland High School selected as a SkillsUSA National Model of Excellence from more than 17,000 chapters. Woodland High School’s SkillsUSA program was selected as one of only 24 Models of Excellence from the organization’s more than 17,000 school chapters nationwide. Models of Excellence chapters are selected based on the demonstration of the intentional learning of personal, workplace, and technical skills outlined in the SkillsUSA Framework for Student Development. In June, two finalists from Woodland High School’s team will travel to Kentucky where they will participate in on- and off-camera interviews, attend an awards dinner at the Kentucky Derby Museum, and be recognized at an awards ceremony in front of an audience of more than 16,000 students, instructors and business leaders. Woodland High School’s SkillsUSA chapter will receive a grant of up to $4,000 from the program’s sponsor, Lowe’s Home Improvement. You can find out more about the SkillsUSA program by visiting their website at www.skillsusa.org. Ruth Richards, an eighth grader (left), volunteered to cook her chicken lasagna recipe for the entire school, selling out the day it was served. Woodland Middle School serves an eighth grader’s chicken lasagna. 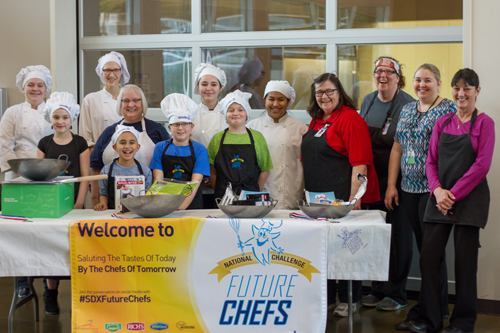 Third and fourth graders competed in the annual Future Chefs of America event. Woodland third and fourth graders compete in the Future Chefs of America event. 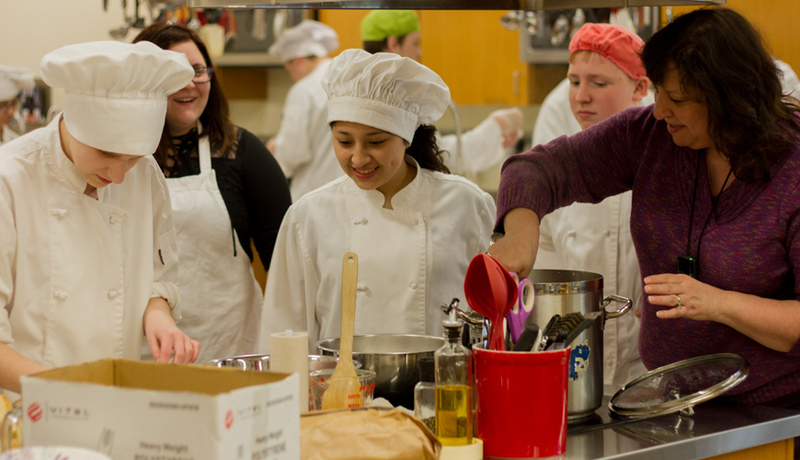 High School students taking Culinary Arts classes volunteered along with school food services employees to help each competing student prepare their meal. Students prepared enough of their recipes for attending parents and community members to sample each recipe, as well as creating a special presentation plate. Chef Dave Williams, Sodexo's Regional Chef, helped each participant select from a variety of small vegetables and herbs to highlight the colors and presentation of their dishes. Students made a variety of recipes including Element Sason by Joshua Castellonos, a third grader; Cucumber Sushi by Treb Lawley, a fourth grader; Asian Slaw with Peanut Dressing by Valentina Wood, a third grader; and this year’s winning dish – Cauliflower Power Fried Rice with Side Kick of Sausage by Laynie Comstock, a fourth grader. “My mom’s an art teacher, so I really like the creativity that comes from experimenting with the way food looks and tastes,” said Laynie, this year’s winner who also participated in last year’s event. “I love being in the kitchen helping to make dinners at home with my sister and parents.” Laynie received a special prize basket including cooking supplies, her own utensils, and a variety of other culinary goodies. All participating students received special chef hats and cooking smocks used during the event as souvenirs. 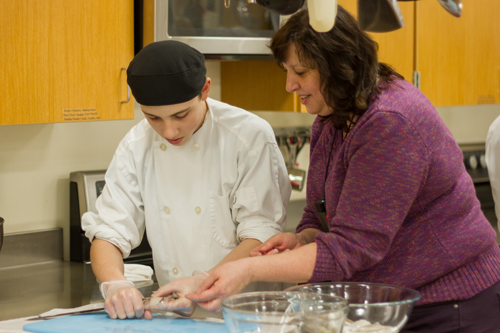 Kimberly Miller helps a Culinary Arts student prepare a squid for an upcoming calamari dish. The Importance of Culinary Arts and Career Technical Education (CTE).